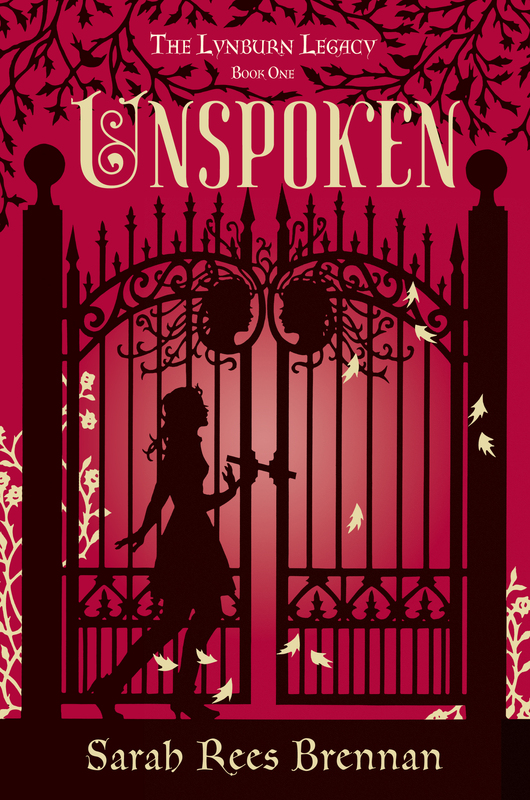 So, I think you all know I love the Unspoken cover. And the thing is that before I received it, I didn’t know what ‘cut paper art’ even was, I just kept yapping about shadows and silhouettes and wanting my heroine to be DOING SOMETHING on the cover, and then my editor found Beth White and had a brainwave. Cut paper art had to be explained to me, is what I’m saying. LEM: Sort of, okay, but using black paper beneath. SARAH: … Nope, just kidding, run that by me again. So I thought it would be fun if Beth White, my cover artist, talked a bit about what she did for you guys! I did probably 5 gates before I got the gate to look imposing because the cover space for the gate is actually a little narrow. I loved the idea of woman’s head with the flowing hair in the gate (SARAH: Yup, the ladies with flowing hair are in the book and are indeed a plot point, so I stuffed my hand in my mouth and giggled with girlish glee to see them so beauteously rendered) and ran with it….again the hair needed to work with the negative space…and there is a fine line between just enough and too many strands. The falling leaves were an overlay but added so much to the cover. I sketch all the art on tracing paper because I can move things around and see the spacing etc. When the art is approved I reverse trace the image onto black paper. Then I cut the black paper in reverse which keeps me true to my line (because it is in reverse and not as I have been looking at it for weeks). Keeps me on my toes for the final cut :)…then I clean up hairs and cuts on the right side and attach it to mat board. Holy God, y’all, I implore you to click on this link. There is some BEAUTIFUL STUFF here. So many beautiful things! I have told you all of the trials of getting Unspoken cover art at all, and how my first cover artist ran away from me! When I first saw that sketch, I practically burst into tears in an airport. I was quite overcome. It was like a miracle to get such a beautiful cover: as I’ve said, I know it’s a super risky and different cover for YA, and I am scared stiff about that, but the stores who are behind Unspoken are super behind it (I already bragged about Unspoken being on display in Powell’s), it is AMAZING ART and I feel privileged to have received it. And I got permission to show you Beth White’s first sketch, and then the cover that resulted! My editor said ‘Kami wears kitten heels!’ and I said ‘That dude silhouette. More buff. Add jacket.’ (I didn’t think I’d ever sit around objectifying a silhouette, but there you go.) And we both said, BOTH SIDES OF THE GATE ALL LADIES ALL THE TIME. And that is how the cover of Unspoken, out right now at this time, was made! In summary, Beth White is a genius! This was brilliant! I didn’t know what cut paper art was either, and this introduction was so engrossing. I love sketching shadow creatures and building and I didn’t know what I was doing! Hah! Thanks Ms Brennan and especially, Ms White! Sarah, I loved Unspoken but that was a cruel ending. How am I supposed to wait till next June for book 2 🙂 It’s a really pretty cover. Interesting post. Thank-you for sharing the secrets of the cover, its a gorgeous. One of my favourites of the year! Cannot wait to see what book 2’s cover will look like ^_^.